We are happy to congratulate Golden Valley Memorial Healthcare (Clinton, MO) & Lake Regional Health System (Osage Beach, MO) as this year’s top level Award Recipients of the Missouri Quality Award. 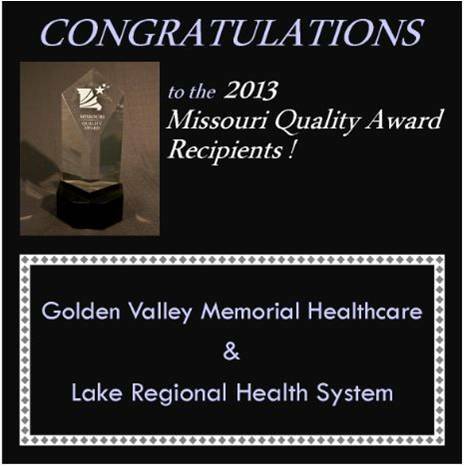 This is the first time Golden Valley Memorial Healthcare has received the Missouri Quality Award and Lake Regional Health System’s second time, following Lake Regional Hospital’s receipt in 2003. Congratulations to both organizations for their hard work and role model performance. Both organizations will be recognized at the 2013 Award Banquet Luncheon on November 21, 2013 in Columbia, MO, at the Excellence in Missouri Foundation Conference. We look forward to celebrating with both organizations next month. We hope you can join us! More information on both Recipient organizations will be available at the Excellence in Missouri Foundation website, coming soon. Information regarding the 2013 Award Banquet Luncheon or the Excellence in Missouri Foundation Conference is available here. Congratulations GVMH Staff – your hard work and efforts at maintaining a focus on the important things is what led to the award and recognition. GVMH is in elite company and one of the model health care organizations in Missouri!